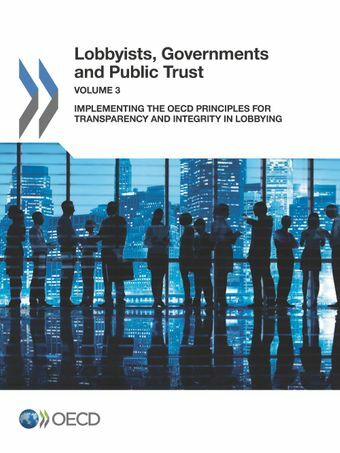 Two in five OECD countries have acted to tighten lobbying standards but the degree of transparency in lobbying still varies considerably from country to country. New regulations are too often adopted in response to a lobbying scandal rather than in a forward-thinking way that could prevent problems. Many “under-cover” lobbyists, such as foreign government officials and diplomats, are not covered by lobbying regulations. The practice of “revolving doors”, where staff can slip between related public and private sectors, threatens the integrity of public decision-making by raising the risks of conflicts of interest and the misuse of insider information and contacts. Only a third of OECD countries have restrictions on hiring lobbyists for regulatory or advisory posts in government. Poor co-ordination of transnational lobbying practices results in different requirements for the same actors in different jurisdictions. Read the highlights of the report. Focus efforts on the implementation of the Recommendation on Principles for Transparency and Integrity in Lobbying to strengthen confidence in the public decision-making process and restore trust in government. Identify relevant data, benchmarks, and indicators relative to transparency in lobbying, the public decision-making process and, ultimately, the broader integrity framework in order to measure costs, identify benefits, and monitor performance. Strengthen the implementation of the wider integrity framework, as it is the prime tool for safeguarding transparency and integrity in the decision-making process in general and lobbying practices in particular. Countries could seize the opportunity to reflect on new integrity challenges and constraints and identify innovative and cost-effective measures. Review policies for managing conflict of interest to ensure that revolving door practices and the unbalanced representation and influence of advisory groups are effectively mitigated. Countries would benefit from highlighting and sharing good practices so as to identify the conditions for policies and practices that effectively safeguard the integrity of the public decision-making process and contribute to building trust in government.